To complete a successful 2015, Dr Sticker set up a unique publicity campaign, combining life-sized stickers with the special sentiment of Christmas. 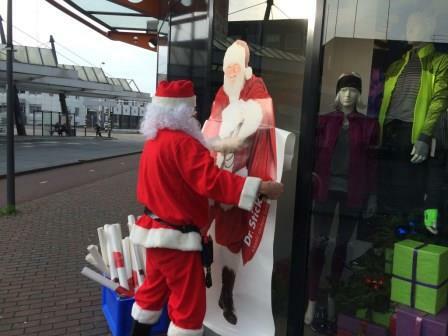 In the center of Roosendaal one of the employees, dressed up as Santa Claus, surprised a lot of companies and store owners. He offered them a free life-size Mr or Mrs Santa Claus . Even the application of this huge colorful sticker was directly taken over by Santa himself. Every concern of applying such a big sticker was taken away. Santa Claus and the Christmas video - a big success! Interested in Mr or Mrs Santa Claus? Of course it is possible to order these Santa Claus stickers for private use. At the moment you can order it online on the Dutch webshop: www.drsticker.nl. Despite the huge size of the sticker it is pretty convenient to apply them, due to a special “easy apply layer”. This ensures a good result. You can use these stickers for different surfaces such as windows, doors and plane walls.